The dreaming mind is very odd. I've always been curious about how dreams arise, and from where, and have often searched my memory for clues and associations from waking life. This one had quite a few. The morning before the dream, I was talking to a friend in the community garden who has grown a huge spiky plant with brilliant blue flowers. It wasn't exactly a thistle, but reminded me of a much smaller native planted called viper's bugloss. I asked him what it was and he handed me the planting tag: "Great Wyoming Bugloss." Where did viper's bugloss grow? At the Boat Lot. The evening before the dream, I had a FaceBook exchange with my cousin, who was often with me at the lake when we were kids, and who lives there now. We were speaking of our mothers, who were sisters: this week marked the anniversary of my aunt's death. I'm going to the lake next week. And just before I went to sleep, I was reading The Saga of the People of Laxandall, from the Icelandic sagas. I don't remember any mention of sturgeons, but certainly of fishing, and of shape-shifting. One of Haldor Laxness's modern novels of Iceland is actually about a woman who changed herself into a fish, long hidden Under the Glacier. So the dream didn't arise from nothing, but who knows how these ideas and memories managed to combine themselves into one of "those dreams" that seem to be telling me something? I wish I knew! But I do believethat we all have within us ancient wisdom, whether it's hidden under the glacier, under the water, or just under the many layers of our busy waking lives. So who are these people and what are they telling me? I think Mike had it pretty close in his comment on the previous post. Although I don't know for sure, I suspect that my companion is my mother; it was with her that I most often visited that place and looked down into the water. There are no sturgeon in that lake, but this one seems like it must have been present in the lake forever, to have grown to such a size. I think it represents something very ancient: probably wisdom that the lake -- my subconscious, or the unknown, or maybe actual wisdom from ancient sources-- wants to show me. That the fish then turns into a woman, and the scene shifts to an interior doesn't feel odd or frightening to me; this doesn't represent a death but a transition, though how I know that is never clear. The older man may be my grandfather, who I often saw in such a place; in fact I have a photograph of him in a grey barn-boarded interior; nevertheless he wasn't physically recognizable in the dream, but in the man's kind, protective, caring manner that created a feeling of safety. Now it gets more difficult: was the blonde woman my mother? My mother was an artist, but stopped doing artwork when she had me and never went back to it; still, it was he great love and she shared it with me. She had dark hair; she died of cancer. The dream woman looked nothing like her; the artwork on the walls looked nothing like hers. Is she an angel, a spirit, perhaps my mother but in a different form, different realm? I think so, and whether these two beings -- appearing to me like the angelic messengers who appeared to Abraham as visiting travelers -- are recognizable or not, the message of the dream seems to be a reassuring one. This life is terminal, our bodies die, but life and spirit continue, and creation -- represented by the art -- continues. I am encouraged by these two beings, both by their manner and what they show me; I should keep creating. Both the ancient fish and the messengers seem to indicate that wisdom is always available, if I look closely and listen for it. Do you see anything different, or something I might have missed? Last night was fitful. It was hot and humid, and I woke again and again, finally going out to the living room to try to sleep on the couch. I did sleep, but was awakened again around 3:00 am by a group, led by a loud male voice, singing Celtic music. It was not a peaceful night. During its course, I had many complicated, disjointed dreams, but one of them came to the surface of my mind this morning and stayed. It was another in the series of infrequent but significant dreams I've had about seeing things in or above the water of the lake where I grew up. In the dream, I am standing near the Boat Lot, an unbuilt piece of land held in common by the Lake Association for the purpose of launching boats by people who didn''t have water frontage. As it was when I was young, the sandy lot is covered with short scrubby weeds, and sloped downward toward the lake. There used to be a short dock, from which you could often see large carp in the warm shallows, gliding under the lily pads that covered this small cove, but there is no dock in the dream. Instead, I am standing up on the bank. Someone else is beside me, but I don't know who it is. Looking down toward the water, I see a large fish -- a huge fish -- moving slowly among pond weeds of the same brownish color as its back. Aloud, I say to my companion, look, look at that huge fish. The fish is the size of a dolphin, as mall whale, and it's definitely not a carp. It has a thick bony back with spiny protuberances, and a long tail. In the dream, I don't identify the fish, but on waking I know: it's one of these. Then the sturgeon changes into a woman. I don't know how this is accomplished, and I don't exactly see it in the dream; I simply know it. Next I am in a dark room paneled with barn boards; perhaps it actually is a coverted barn or shed. The walls are covered with artwork: artwork done by this shape-shifting woman. My companion is no longer with me, but there is anolder man in the room; he is the woman's father who seems responsible for her. Somehow I learn that she has been ill -- some sort of cancer -- but she has recovered and continues to do this work, which I study on the walls. Although the images do not remain in the morning, in the dream I am moved by them, and tell her father that they are very powerful and beautiful. Only at that point does the woman herself enter the room; I encounter her indirectly, as if in my peripheral vision. She is in young middle age; has short blond hair and is wearing a white blouse; her presence is extremely beneficent. I repeat my feeling about her work and she smiles but does not speak, and I wake up. Tomorrow: my interpretation -- but feel free to offer yours! Yesterday was cold, but bright enough to slice the eye. I left the studio around 4 and walked through the little neighborhood park, where the snow now reached half-way up the red-painted wrought iron fence around the play area. No one else was out. At the other end of the park I looked at the empty skating rink as I walked past, then stopped and climbed up on a bank of snow to examine it more closely. The ice, made by flooding an irreegular circle of piled-up snow, was smooth, with a light dusting of snow. Three dark trees, with snow left around the base as an optimistic cushion for flying bodies, stood in the center. It all reminded me of the rink my father and grandfather made in the backyard of the big house in Sherburne several years when I was young. The ice, as I remember it, was always perfect. On the back side stood two tall spruce trees, and in the front, a huge sugar maple that dominates that street even now. My cousins and friends all skated there, staying out until we were blue with cold; we had wool sweaters and nylon snowpants but no fleece or down, and our feet inside our white figure skates would ache for an hour after we were finally ordered inside. We never played hockey; we just skated under the trees. There were other places, too; the school rink on the playing field behind the shop and band room, or a town rink in the park downtown, and later on the lake where my parents built a house. Sometimes, in a very cold winter, we'd skate on the brook that ran through my cousins' farm, which gave the excitement of a journey rather than going round and round, as well as the fear of falling in. We knew the spots to avoid, around willow trunks and branches emerging from the ice or places where there were rocks and faster currents in summer, and so far as I know, no one ever fell through. I took a few photographs from the far end of the park and then decided to go back to the northern side. The snow crunched under my feet with a specific sound, as accurate a gauge of the temperature as any thermometer. I looked up at the icicles hanging from the eaves of houses, knowing what sound they'd make when knocked off with a broom handle, or when shattered on the ice after being used as mock swords: a brittle glass harmonica. In fourth grade, I remember there was a book about a little girl who had an accident while skating; something happened and she was cut badly with the blade of her skate and had to go to the hospital in an ambulance. It must have been written to teach children about the reality of hospitals. But somehow, I realized, it had become conflated in my mind with another book about a girl who had become a saint after dying in some unexpected and heroic way. Where did these books come from? They weren't the sort of thing my mother would have found in the town library, and the second one, it seemed to me, must have belonged to one of my Catholic friends who was taking catechism classes. Oddly, though, they had joined to create a memory of childhood injury, death, and saintliness, illustrated with vague mental images of white skates, blonde hair, ambulances, and a child in a field of flowers. When I reached the north side of the rink again, there was a young woman sitting on a bench. She wore an off-white coat and was lacing up her figure skates. On the path in front of her was a wooden sled with a curved back, and on the sled, a swaddled baby. The mother wore headphones, and smiled at me. I wondered what she planned to do with the baby while she skated, all alone on the frozen rink under the trees, and was tempted to walk around the rink once again, to be able to see. But it was getting late and I needed to go home, so I continued down the street, imagining the tall dark trees with their white skirts, like dervishes frozen in mid-twirl, above the baby resting in its sled on the ice, next to a bank of snow -- an arctic version of Moses in the bulrushes -- listening to the rhythmic slash of its mother's skates cutting the ice. In the dream, my father-in-law climbs out of his bed and disappears. All night, the three of us search for him - his dead wife, my husband, and me. At dawn we see him climbing over the porch railing, wearing an old grey sweatshirt, and a red bandana tied around his forehead. He enters the house without a word and goes to his room.When the morning paper comes, there's an article that says he was seen among the homeless people in a rough part of town, preaching or teaching or talking, they're not sure. He greets us from an armchair in the lobby, and gets up slowly, groaning. There’s a wan smile. “Our usual table is reserved,” he announces, and hands his bag and cane to J. Fifteen minutes later we’ve all gotten our food from the buffet – it takes him a long time now – and are seated. “What sort of soup is this?” he asks me, staring at the thick white liquid in his bowl. “Clam chowder. The New England kind.” He turns up his nose. “Eech,” he says unhappily, searching through the bowl with his spoon. “I don’t want chunks of anything.” These days, what he likes for soup is broth. “So how are you?” I ask. “No good,” he says, shaking his head. “Declining very rapidly.” It used to help when I reminded him that while the part about decline might be true, the rate wasn't, since he’d been saying the same thing for years; today I don’t try that logic. He is declining, and any protestations to the contrary would be denied for the pretense that they were. None of us can tell how steep a slope he’s on, though, so we do our best to ignore it and talk of other things, but as his world narrows that becomes harder and harder. He can’t hear the television or radio and find world politics very depressing; his eyes won’t allow him to read much, though he still tries; he has limited meaningful or mind-stimulating conversation now that most of his friends have died; he no longer writes letters, and phone conversations are getting very difficult. He looks forward to sitting with us after these lunches, in his own room, surrounded by books and papers, having a conversation that ranges easily from one subject to another: the usual tour of the family members, what he’s gotten in the mail, what he thinks of Bush this week, what he’s reading, how his friends are, who’s been to see him. When we can, we try to engage him in stories about his childhood or career, or the subjects he taught and cared about. Today he’s crotchety, and he doesn’t seem to want to stay on any particular subject, except to ask me to explain about the Anglicans in Africa, and then, when I do, he tells me the whole problem is because my church has lost its orthodoxy and is becoming just like the Unitarians – which is particularly ironic, considering that he was a Unitarian Universalist minister. “You just want someone to hold the line,” I tease him, trying not to allow myself to get annoyed. “You want the Catholics to be Catholic.” He smiles a little, caught out, and tells me about a former Episcopal priest in the same town where he served. “He was a good man,” he said. “And very orthodox. But I felt closer to him than any of the other ministers in town.” Tomorrow, he’ll call and offer a half-hearted apology, saying he was very tired. I’d like to talk to him about the article in the Times the other day, about using the story of Philoctetes to instruct young medical school students. Philoctetes was a Greek warrior who, according to one version of the legend, was bitten in the foot by a snake when his ship – bound for Troy – stopped for a while. The wound festered and refused to heal, and its stench was so severe that he was left on the island while the other sailors continued on. 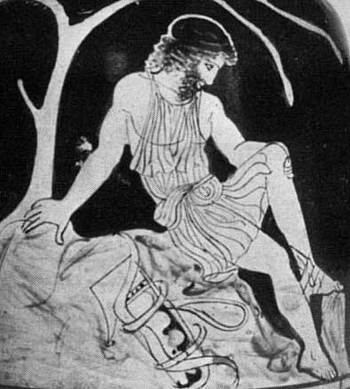 In the play that Sophocles wrote about him, Philoctetes is an old, lonely, bitter man, complaining constantly about his wound and driving everyone away from him. When a young man, who turns out to be the son of Achilles, appears on the island, he is repulsed but also drawn to the suffering old man; he wants to leave but can’t. His mission, masterminded by the wily Odysseus, who waits offstage, is to steal Philoctetes’magical bow and arrows, since it has been prophesied that only they can kill Paris and bring an end to the Trojan War. But that becomes secondary to the moral questions of suffering, loneliness, and awakened compassion that Philoctetes – this ancient Greek counterpart to Job - brings up. Others have been moved by this story: Seamus Heaney used it as the basis for a play, “The Cure at Troy,” moving on from the action in Sophocles play to follow Philoctetes, who, after Achilles' son gives him back his bow and arrows, goes with Odysseus back to Troy – against his will – is cured of his wound, kills Paris (the one whose love for Helen started the whole bloody mess in the first place), and becomes a hero. I haven’t read Heaney’s version, but will search it out. I doubt if my father-in-law has read the Sophocles play either, in spite of the statue of Socrates that sits beside him all day. But it’s the sort of thing he used to like to talk about. Now that he’s “on the sad height” himself, I wonder. The medical students, of course, were supposed to put themselves in the place of the young man: entreated to stay and talk, to show compassion, even when they could do nothing to effect a cure. I thought of the research team whose work I’ve helped publish for years, who ask the most difficult questions about our health care system: “Is more better?”; “How much is enough?” “What kind of care are we getting – and what do we really want - at the end of life?” I thought of a Montreal friend, a nutritionist who works with the very elderly and ponders all the bypass surgery that is done routinely now, and often ends up prolonging the lives of people who would have died years before – like my father-in-law – but, she wonders, to what sort of quality of life at the end? “In some ways, it really would have been better if I’d died back then, before my surgery,” he told me once. “I was still vital, still engaged, still doing work. Still in the thick of it!” When he says that, he’s judging a whole decade in the light of the past two or three years, and begging me to disagree. And while I may not argue anymore with “declining rapidly” I will continue to refute this one. He was an excellent candidate for bypass surgery, and in his case, I think the resulting years probably were worth it by just about any measure – including his own estimation, when he’s being honest - even though he outlived his wife and has had several years of increasing limitations. I think of his face last year when his book was published: as in the case of Philoctetes, there was more to be done. Her coat startled me, like blood on the snow would have, or the dash of a cardinal in this park inhabited only by crows, pigeons and sparrows. The coats of the skaters below us were black, dark blue, grey, and brown; enlivened only by bright scarves and the occasional bend of a gliding figure into a pirouette. Passing us on the snow-covered path above the lake were the after-game hockey players in oversize jerseys, carrying their comma-shaped sticks; parents with little children tethered behind them on pink or blue sleds; and the occasional tweed-coated romantic young men with skates tied and hanging by their long laces over their shoulders, and no hats covering their curls. 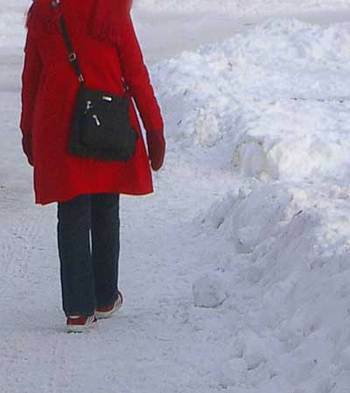 She – the girl in the red coat – had no skates at all; she was just out walking, like me, in her red basketball shoes and red wool coat and her black hat with a red felt poinsettia on it. Down on the serpentine ice the skaters circled mostly in one direction like dancers on a dance floor, their course marked by islands of evergreen trees stuck in banks of snow in the middle of the frozen, narrow lake. A man in a wheelchair moved as if his chair had grown runners and a woman in white figure skates pushed a baby carriage ahead of her. An older couple, hand in hand, skated slowly and gracefully together, matching steps; she wore a full-length white fur coat. A young girl wearing a backpack accelerated and then casually tipped forward to glide on one foot; a tall young man swept elegantly up the middle at twice the cadence of the others. Classical music played from the loudspeakers in the trees, which were still festooned with long irregular loops of white Christmas lights. My feet itched to join them, but although I skated a lot when I was young, I was never as good as the weakest of these skaters, all of whom seemed as if they had been born with runners on their feet. I imagined a broken wrist, knocked-out teeth…it was fine, instead, to watch, to listen to the music for a few minutes while the wind whipped color into my cheeks. And then I walked slowly up the path and out of the park and across the street, waiting for a bicyclist carrying cross-country skis in an upright X on the back of his bike. In the café it was nearly closing time. Two patrons finished their coffee at a table near the side windows. Behind the counter, against a dark grey wall, a young woman - her body and face obscured - bent to take a plate out of the sterilizer; her wrists were bare and delicate and her hand holding the yellow plate was very beautiful. I walked home after that, marveling.